The latest buzzword in the world of finance seems to be “cryptocurrency.” But what exactly is this new type of currency? And how can you use cryptocurrency in your own personal life? Basically, cryptocurrency is a digital or virtual type of currency. It’s much more secure than traditional currency because it is encrypted with cryptography for security purposes. As such, it’s difficult for cryptocurrency to be counterfeited, which is a huge benefit. So, now that you know what cryptocurrency is, what role does it play in securing a loan? Do you know the difference between secured and unsecured debt? Learn here. What is a Crypto-Backed Loan? Given the heightened level of security of cryptocurrency, it’s easy to understand why this type of asset would be attractive to consumers and investors alike. And as cryptocurrency becomes increasingly popular, it makes sense that the conventional realm of finance would adopt it. Essentially, a crypto-backed loan is a type of loan that allows you to access the value of your cryptocurrency without having to sell it. Traditional secured loans, backed by collateral, require borrowers to provide an asset of value to back up a loan in order to obtain funds. With a crypto-backed loan, you don’t have to sell your cryptocurrency to get the money you money need. And, rather than using your home or business as collateral, you can collateralize your crypto assets instead. 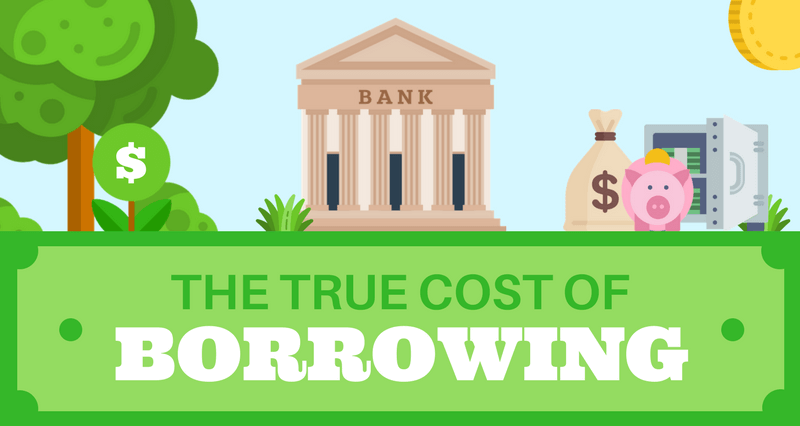 Make sure you always know what the true cost of borrowing is. Click here. There are a few different valuable assets that consumers use and leverage in order to secure a loan. The exact amount of collateral that consumers must provide is typically determined by the loan-to-value (LTV) ratio of the loan. With a crypto-backed loan, your cryptocurrency is used instead of these other valuable assets to back the loan. The biggest advantage of a crypto-backed loan is that there is no need to sell your cryptocurrency to receive funds. Rather than using your home, car, or business assets, you would collateralize your crypto assets instead. This is important because you won’t lose out should your crypto assets increase in value over time. Rather than cashing them out, you can still hang on to them and benefit from their appreciation over time. You can use your crypto-backed loan to invest in real estate, diversify your investments, pay off your taxes or any higher-cost debt you might have. What Can I Use My Crypto Secured Loan For? Of course, like any other type of loan, it’s important that you only take out a loan that you are financially capable of making payments on. If your current financial situation will make it extremely impossible for you to make timely payments, perhaps now is not the time to apply for a crypto-backed loan or any other type of loan product. Will a Crypto Loan Affect My Credit? It’s always important to make financial decisions that will not negatively affect your credit score. This important number plays a key role in your financial life and your ability to secure new credit and loan products. As such, it’s easy to understand why responsible consumers would wonder about how a crypto-backed loan would affect their credit. Traditional lenders will typically pull credit reports on consumers who apply for loans. This helps lenders assess what type of borrower an applicant may be before deciding whether or not to approve a loan application. When a lender pulls a credit report, the consumer’s report will be noted as having a “hard pull” (click here for more information about how new credit affects your credit score.) This can cause credit scores to temporarily dip. That’s why it’s not suggested that consumers apply for several loan products within a short period of time. But with crypto lenders, this situation is a bit different. Generally speaking, many crypto lenders don’t pull credit reports. Given this, no “hard pulls” will be noted and therefore your credit score should remain intact. That said, it’s still important to verify this with the lender that you choose to work with if this is a concern of yours. Check out this infographic to find out what affects your credit score. What Happens to My Cryptocurrency After I’m Approved? It’s natural to be concerned about what will happen to your cryptocurrency if you’re approved for a crypto-backed loan. After all, it is a valuable asset that you will want to have protected. If you work with a trustworthy and reliable lender, you can rest assured knowing that your cryptocurrency will be safely stored. That said, the security and storage will be different for every lender, so you will definitely want to ask questions about the security of your cryptocurrency with your lender. All cryptocurrency assets are typically stored with a depository trust that has the legal and insurance requirements needed to keep cryptocurrency stored safely. Further, any increase in the value of your cryptocurrency during the length of your loan will not affect the loan. Looking to Apply For a Secured Loan? If you’re looking for a secured loan and are interested in your collateral options, Loans Canada can help. We can match you with the right lender who offers secured loans that work best for your needs.